Another day, another excuse to cook up a challenge. Today I’ve made another Abel & Cole recipe. This time it’s a rather easy rustic Irish Potato Bread and boy did it taste scrummy for breakfast! Even my 19mth daughter Annabel demolished it whining for more. 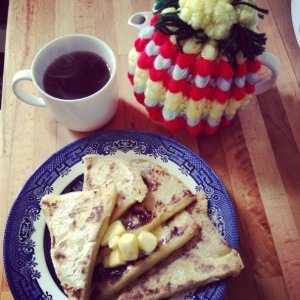 This entry was posted in Ramblings and tagged Abel and Cole, competition, Irish potato bread, recipe by whysamiam. Bookmark the permalink. You must live in London! My daughter used to get weekly Abel and cole shipments! Now she’s working long hours… The bread looks fabulous.